Access: Available once step 1. Initial Processing has been completed. Note: The Clipping Box only affects the display, not the results of any outputs of step 1. 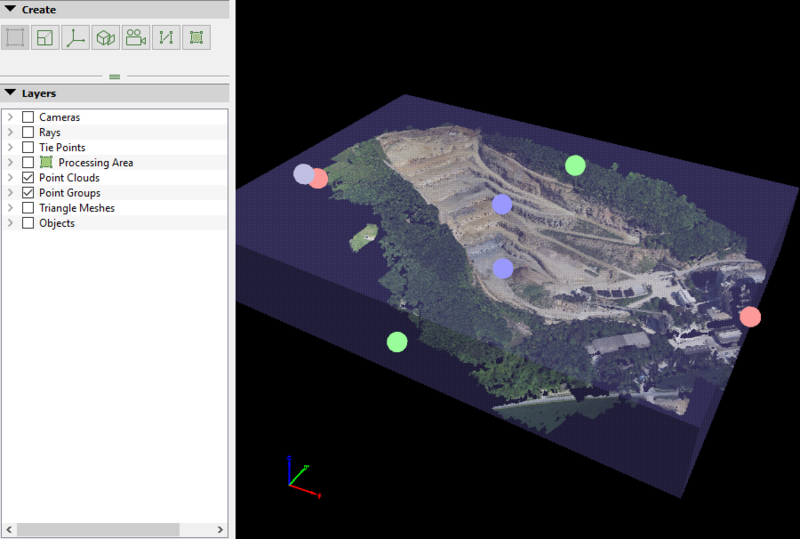 Initial Processing, the Densified Point Cloud or step 3. DSM, Orthomosaic and Index. 1. In the rayCloud toolbar, on the right, click the icon to display and edit the Clipping Box. Red balls to resize the X length. Green balls to resize the Y length. Blue balls to resize the Z length. External blue ball to rotate the box. Change the values of the different parameters. For more information about the right sidebar parameters: Menu View > rayCloud > Right sidebar > Clipping Box. 3. Click the icon to hide the Clipping Box. 4. (optional) Click the icon , to apply the Clipping Box in the 3D View and visualize only the area contained in the Clipping Box.